For the Bulls, too, as the trade of popular captain Luol Deng for a bag of bamboo shoots after the earlier loss of Derrick Rose for the season sent everyone into a depression deeper than the snow piles. So the Bulls stumbled through a pair of losses to the Washington Wizards in a five-day stretch, the only games this season when the teams played one another. The Bulls were led again by D.J. Augustin with 25 points and six of 11 threes. Augustin, famously released earlier this season by Toronto, now leads the Bulls in scoring and has by far led the team the most times in scoring since the beginning of March. Everyone was cold then; the Bulls now are hot and Saturday they burned the Wizards in a dominating 96-78 romp between two teams that could meet in the first round of the playoffs. 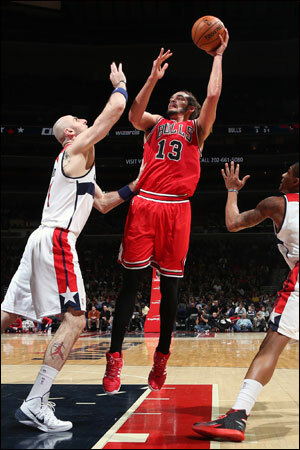 “I really don’t remember; it was a long time ago,” said Joakim Noah about those two Washington wins in January. Nobody’s put away their winter coats, gloves, and Noah certainly not his fashion collection of stocking caps and scarves. But things have changed. It’s time for baseball, the Wendella and the NBA playoffs. The way the Bulls played Saturday in Washington against a team with playoff visions was proof as well as impressive in basically an end-to-end conquest that made a statement to at least one former Bull. The Bulls did so with an exclamation point, a defensive blanket so stifling the Wizards usual high scoring and electric guards were left tangled in knots of Bulls bodies. Wherever John Wall or Bradley Beal or Trevor Ariza turned, there was a Bulls defender helping and trapping and blitzing until it had to look like eight against five to the not so magical Wizards. It was playoff basketball, and just one team was playing. The Bulls were led again by D.J. Augustin with 25 points and six of 11 threes. Augustin, famously released earlier this season by Toronto, now leads the Bulls in scoring and has by far led the team the most times in scoring since the beginning of March. Carlos Boozer added 16 points and Jimmy Butler led the team with nine assists. The Bulls remained tied for third with the Toronto Raptors, who won in Milwaukee, though Toronto retains the tiebreaker as division leader. The Wizards in sixth thus remained a possible first round playoff opponent. “I think we we’re playing pretty well,” said Noah with 21 points and 12 rebounds in providing the Wizards a training video on what playoff basketball is like. The Bulls with five games remaining matched their season win total from last season at 45-32. Washington fell to 40-37, and now face slipping to seventh as the Charlotte Bobcats are just a game behind. The teams meet Wednesday in Washington. If Charlotte wins they would have the season tiebreaker. So now there are five teams in play for the positioning and matchups from Nos. 3 through 7 in the Eastern Conference. Thus the first round matchups are not likely to be determined until the final few days of the regular season, which concludes April 16. The Bulls will be in Charlotte that night. The playoffs begin April 19. So until then the Bulls are on Tom Thibodeau time, which means just what is immediately in front. On Saturday, it was the Wizards and the Bulls ran right over them. There was no guessing who it was as the Bulls essentially produced the basketball version of a no hitter. The Bulls took a 28-16 first quarter lead and led 52-26 at halftime. It was the fewest points the Wizards, who average more than 100 per game, had scored in a half all season. It also showed the Bulls’ defensive versatility with Kirk Hinrich and Butler pressuring and overplaying and all the big men helping and trapping more aggressively than usual. The Wizards continue to be without Nene, the post player who gives the Bulls the most trouble with Washington. Of course, no one complains much about injuries with the Bulls given the absence of Rose for two years. 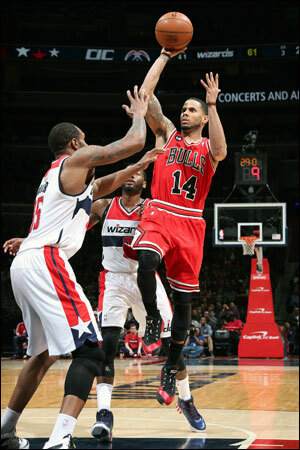 The Bulls simply overwhelmed the Washington offense with a bit of an adjustment. The Bulls usually like to drive the pick and roll down to the baseline and away from the middle and provide the help baseline. This time they were more aggressive off the pick and roll, showing hard and blitzing, a more aggressive tactic to keep the Wizards guards off balance. The Wizards don’t operate particularly well in the half court. They did get a few fast breaks, but without them they are a below average offensive team and the Bulls made them look that way the first half. The Wizards did adjust at halftime, immediately coming out reacting more quickly to the trap with the screener rolling harder to the rim. The Wizards also tried to push the ball more, and put Boozer guarding Booker in more pick and rolls instead of Gortat. The Bulls continued to make some beautiful plays with their passing (24 assists on 35 scores), Butler with a sharp bounce pass to Noah for a two handed dunk and the play of the night with Noah bouncing a pass inside to Mike Dunleavy who shoveled of a quick touch pass to Boozer for a score. 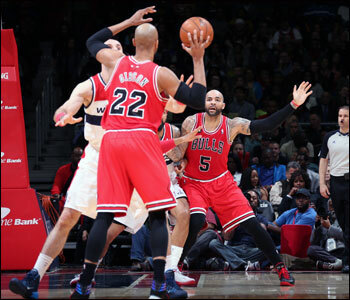 Boozer earlier in the game had made a similarly fine pass after Hinrich intercepted a full court pass. He found Boozer in the paint and as Boozer went up for the shot and the defense reacted, Boozer slipped the ball to Noah for the slam dunk. “We had a number of guys step up and make big plays for us,” observed Thibodeau. But the Wizards continued on that run, scoring on 14 of 15 possessions to bring some life back into the building and reduce the Bulls lead to 70-59 with about two minutes left in the third quarter. But this Bulls team of two months later responds with offense as well as. The Bulls often come out of timeouts with a variation on a down screen play for Dunleavy and he made the shot. Boozer got deep for a score and Augustin finished off the quarter with a tough runner for a 76-61 Bulls lead after three. The Bulls then blew it open to start the fourth quarter as Noah and Butler owned the backboards. Noah, emotional as usual and even bringing out his pantomime holstering show after one jumper, drove the middle for a three-point play and scored on a driving layup beating Gortat off the dribble. Noah then found Butler with a sidearm fastball that would have made Don Drysdale proud. Butler laid the ball off in one motion to Gibson, who was fouled. His two free throws with 9:59 left made it 85-63 Bulls and the Wizards regulars were soon vanishing. But not before another symbolic moment. The Bulls were leading 91-67 when Butler threw up an off balance shot to beat the 24-second clock. The ball skimmed the rim and began to bounce out of bounds when Gibson jumped out of bounds to save the ball as sculptors apparently insisted Wizards’ players remain still. Gibson directed the ball into the backcourt, where Hinrich went diving out of bounds to save the ball back to Butler, the Wizards formal picture session apparently not done. The Wizards called time and sent in the shock troops for the other stunned troops. That’s the difference with teams like the Wizards. Not that they can’t win a series, but the playoffs are different. Every game is a hard game, and until you’ve experienced it you have no idea. Most of these Wizards players have been happy to get to .500 on the season. They’ll talk about having to play harder for the playoffs and it starting all over again. But a game like Saturday’s is why a team like the Bulls is more prepared. Especially the way they’ve been playing. It’s why Thibodeau doesn’t want them to relax, and why they don’t care to. It’s getting close now.